Blind Spot & Lane Change Kits. 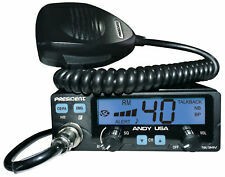 President Andy 12/24-Volt CB Radio with 7 Color LCD Display. Flush Mount Monitors. Base Station CB Radios. Fixed Mount CB Radios. Handheld CB Radios. Handheld CB Antennas. USED, BUT IN GREAT CONDITION. ON A SCALE OF 1 TO 10. Blind Spot & Lane Change Kits. Flush Mount Monitors. President Johnson II 40-Channel CB Radio 12/24v. President Johnson II CB Radio. Base Station CB Radios. Fixed Mount CB Radios. Handheld CB Radios. Handheld CB Antennas. 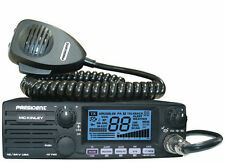 Uniden John Q 40 Chanel CB radio. Powes up and the light and chanel indicator illuminate. Used an inverter to test, may be in pictures but not included. The other two, squelch and mic gain both move just as nice. CB Radios & Accessories. CB Antennas. CB Accessories. Amature Radio. Modulation modes:AM / FM. - 40 channels AM / FM. sensitivity at 20 dB sinad: 0,5 µV - 113 dBm AM / 0,35 µV - 116 dBm FM. Carrier power: 4 W AM / 4 W FM. Manual squelch and ASC. Squelch : Manual squelch. Double DIN Stereos. Single DIN Stereos. Squelch sensitivity : minimum 0.2 μV - 120 dBm / maximum 1 mV - 47 dBm. - Beep Function. - Roger Beep. Beep Function . This includes radios that arrive defective. - 40 channels AM. - Up/down channel selector. - Weather channel with Alert. - 12 / 24 V. - ANL filter, NB and HI-CUT. - Preset 9/19. - Dual watch. UNIT POWERS UP WHEN PLUGED IN . BEING SOLD AS IS. Has the ASC automatic squelch feature, and a very simple to operate radio with a large orange backlit display panel. Manual squelch and ASC. 40 channels AM / FM. Mode switch AM / FM. Channel rotary switch. CB antenna is one of the smallest cb antennas on the market. With a length of only 34 cm cb antenna is comfortable to use and storage, while providing good performance. The box includes a radio, microphone, microphone clip, mounting bracket and screws, power lead and instruction manual. President McKinley USA 40 Channel CB Radio SSB 12/24V. 40 channels AM / SSB. Base Station CB Radios. Handheld CB Radios. Handheld CB Antennas. Fixed Mount CB Radios. Car Audio & Video. Video Monitors. Bench tested with a battery and it seems to work fine. This is just what is shown in the picture. No box or manual. This is the Internal Speaker Plug for President and Uniden radios such as the HR-2510, HR-2600 and Lincoln. It enables the internal speaker in the radio. 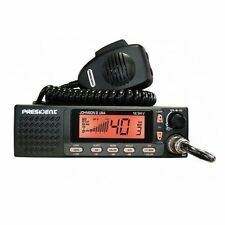 President Teddy R 40 Channel AM CB Radio. Condition is Used. Radio works properly. Shipped with USPS Priority Mail. THESE ARE MUCH BRIGHTER AND HAVE A MUCH WIDER PATTERN THAN ANY SIMILAR ITEM BEING SOLD. I BUY THE COMPONENTS AND ASSEMBLE THESE MYSELF. THESE ARE NOT CHEAP TO BUILD AND I'M NOT TRYING TO GET RICH DOING IT, BUT I FEEL THEY ARE THE BEST OUT THERE. TUNING DENSEI EC-2002 6PIN PLUS. CB Radios & Accessories. CB Antennas. CB Accessories. echo range limited to 1/5 - to avoid distorted echo and illegible modulation. Amature Radio. Examples of radio socket 6 - pin, with which the microphone is working without modifications. Condition is Used. This is an original Model # 1011001 Taiwon R.O.C. President McKinley Citizens band radio. It has not been modified for extra frequencies but the clarifier has been bound (unlocked). Manufacturer: MIDLAND. MIDLAND PRESIDENT 120 MARINE RADIO. Model: PRESIDENT 120. You will receive everything you see in the pictures.If it's not in the pictures, you will not receive it. We provided pictures to show the condition of this item. This is the Accessory Connector Plug for President and Uniden radios such as the HR-2510, HR-2600 and Lincoln. It allows for the connection of an external speaker, PA speaker or CW key to your radio. 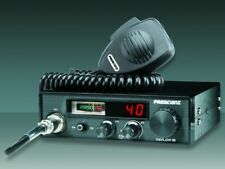 President Washington Base CB Radio AM-SSB Transceiver 40 Channel with Diesel 360-7 Echo Power Modulated Hand MIC with 4 pin plug. Used but in good working condition. Selling my fathers CB equipment as he has recently passed away. Radio and MIC are in good working condition to the best of my knowledge. Selling as is. Electrolytic capacitors dry out with age, and heat. An installation guide is provided with the kit. The kit comprises the following capacitors (44 in total) Photo of the kit is generic to cover a wide range of Kenwood, Yaesu, and Icom radios. For security, the President Ronald features key locking to take the radio with you for extended stays. The President Ronald is the next generation of transceivers from this manufacturer. Compact and lightweight to fit into any space. Electrolytic radial capacitor kit for Cobra 29 / 89 XLR and President Honest Abe,President Dwight D (old), Teddy R, Zachary T (old), Robyn AM-500D, Teaberry "T" Bear, "T" Command, Titan "T" (PC-198 or PC-241AB ). Easy to mount in small areas where other CB radios wouldn't fit. You can count on President for Quality Products. - 40 channels AM. - Weather channel with Alert. - Up/down channel selector. - Preset channel programmable. An installation guide is provided with the kit. Electrolytic capacitors dry out with age, and heat. The kit comprises the following capacitors (65 in total) The photo of the kit is generic to cover a wide range of Kenwood, Yaesu, and Icom radios. Cobra 25WX w/ President JFK Radio Lot. Both radios have been tested. The Cobra 25WX works like it's supposed to. The President JFK needs a tech to check it out. It has a good output carrier, but no TX/RX audio. President BILL. Front microphone plug. Mode switch AM / FM. F function key. Multi-functions LCD display. Back light color Manual squelch and ASC. Preset channel programmable. As shown in the photos I plugged this unit in and it lit right up. All of the channels displayed as they should. Dead keys 5, swings 9. Very nice condition. A channel map will be included. President Johnny III CB Radio. Condition is Used. Shipped with USPS Priority Mail. This cb is in excellent working condition. It comes in the original box with the user manual and some other paper work. This radio was tested to power on only as I do not have antennas or know how to work it. FREE Trial! Small radio with big radio sound. Was just peaked, tuned, and aligned. Dead keys 4, swings 6. Has talkback. WALKER II - President 40 Channel CB Radio with ASC, Scan, Roger, Weather & More! Manual squelch and ASC. - Roger Beep. - 40 channels AM. - Channel rotary switch. - Weather channel with Alert. - Front microphone plug. - Front panel : brushed aluminium finish. - Mode switch AM / WX. AND UNIDEN MICS 4pin-9,99each. ASTATIC-4pin used on cobra 29- 35.00each. THERE NICE. SELING AS IS. Items are in pre-owned used condition with noticeable signs of defects. These items are UNTESTED by me personally and being sold as is for PARTS & Repair so please see photos and ask any questions you might have. Just a Warning it is Possible Some of these lots will Carry odors of their original owners and due to the age of some of these pieces such as a musty or smoke smell or others, if this is the case I apologize in advance as it is out of my control. THANKS! CB Radios & Accessories. CB Antennas. I understand the radio will be 13/15 watts AM with variable power so it should manage around 50w PeP AM and up to 50 watts noted for FM so makes it versatile for both EU and USA markets. RELISTED FOR NON-PAYMENT!! We have a President Dwight D CB radio Base Statation. THE CLOCK DON'T WORK! If you look closely you will see 2 scratches but this radio is in really nice condition. I would turn down the modulation. The reason why this radio dead keys 4 Watts and modulates 24. Comes with Mic. BEING SOLD AS IS! NO REFUNDS. NO RETURNS. US SHIPPING ONLY. MAKE ME AN OFFER!! PAYMENT DUE WITHIN 48 HOURS AFTER PURPHASE!!! 40 channels AM / SSB. MCKINLEY USA - President Deluxe AM/SSB 12/24V CB Radio. The President McKinley CB radio adds a good, stable single sideband radio to the market where that was lacking. It also has the capability to pick up NOAA weather radio stations and be alerted to any oncoming storms. Vintage President AR144 CB Radio Base Station 40 Channel AM SSB Transceiver WORKS!! In very good shape! Condition is Used. Tested and works as it should! Comes with road pro mike. Shipped with USPS Priority Mail. President Jackson 240 Channels. Condition is Used. Shipped with Economy. 13 volt dc kabel not included. President has been creating devices to keep its customers connected since 1969. Its products are designed around available technology and customer satisfaction. 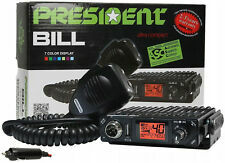 Find the right low-priced President CB radio for your needs on eBay. What is the ASC technology built into President CB radios? The ASC or "Automatic Squelch Control" is a technology that President patented in 1996. This feature allows for received signals and existing noise to be evaluated through the CB radio. The signal to noise ratio is monitored and determined whether or not to be heard by those receiving the transmission. The listener is able to utilize the CB radio for services such as security without the necessity of making any manual adjustments or checking the noise levels received through the receiver themselves. What are some of the features President CB radios offer? ASC technologies - The ASC or "Automatic Squelch Control" allows listeners to enjoy clearer sound transmissions without the disruptions of noise or interference when using the CB radio for communications purposes. NOAA Weather - Receive alerts and warnings concerning weather conditions that are put out by national weather services. This feature is intended to keep you informed and safe wherever you are traveling. 12- and 24-volt compatibility - The President CB radios are being built to allow for easy compatibility with all types of vehicles they may be installed in. You will find certain model CB radios that offer both 12- and 24-volt connection capabilities to allow for changes taking place in technology. Color changing displays - The color changing display feature gives you the ability to set the display screen background to the desired color that is easier for viewing in all types of lighting. Channel scanning - Enjoy hands-free channel scanning to find the stations that may work for wherever you may be. This gives you the ability to stay connected even when traveling through some of the most remote areas. What should you look for when purchasing President CB radios? Installation - Different model CB radios carry certain requirements for installation. It is important to understand these needs and ensure that you can meet them prior to purchasing the radio. Features and functions - Comparing the features and functions of the different model President CB radios will allow you to see what the capabilities are of these devices when it comes to security and communications. Installation - Different model CB radios carry certain requirements for installation. It is important to understand these needs and ensure you can meet them prior to purchasing the radio. Cost - There are high- and low-end CB radios out there. Knowing what each option offers and comparing their cost will give you a better idea of the value you are getting from your investment. Content provided for informational purposes only. eBay is not affiliated with or endorsed by President.